(playing with the Dutch language). Obviously, to get a basic use of a language, you first must learn the language (LEERtaal). To participate in a nation’s labour market with a desired job, a professional use of the language is necessary (WERKtaal). But turning a language into fascinating games, use it as a social playground… for me that is the ultimate and most beautiful the Dutch language has to offer. Dictations, slogans, poems, yells and family names in WORDLE are just a few examples of SPEELtaal. Live to play. Play to live. Click to listen highlighted text! SPEELtaal. (playing with the Dutch language). Obviously, to get a basic use of a language, you first must learn the language (LEERtaal). To participate in a nation’s labour market with a desired job, a professional use of the language is necessary (WERKtaal). But turning a language into fascinating games, use it as a social playground… for me that is the ultimate and most beautiful the Dutch language has to offer. 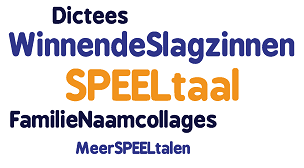 Dictations, slogans, poems, yells and family names in WORDLE are just a few examples of SPEELtaal. Live to play. Play to live.